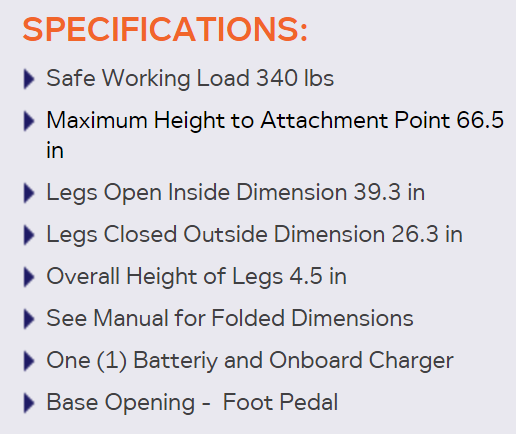 Electric Patient Lift - 340 lb Capacity - SHIPS FREE! Hoyer Advance Electric Patient Lift is a Lightweight Patient Lift that is powerful and portable. Manufactured by Joerns, this Portable Hoyer Lift comes in two options--as either a Manual-Hydraulic Patient Lift or as a Battery Powered Electric Lift, the superior design of the Hoyer Advance Lift makes it a portable, versatile, and hard-working patient lift a true step forward in both design and performance. The Advance's unique Swan neck leg design allows the lift to get close to wide obstacles. The Swan neck design also ensures that the patient feels safe and secure during the transfer. By using the very latest design and manufacturing technologies, Hoyer ensures that the Advance is the most functional and stylish lift in its class today. On the manual version the pump is very easy to use and does not take a lot of muscle. 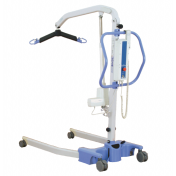 The hydraulic pump is smooth, easy to operate and lowers the patient smoothly. The power version has a nice coiled cord to the hand control and uses a rechargeable battery. 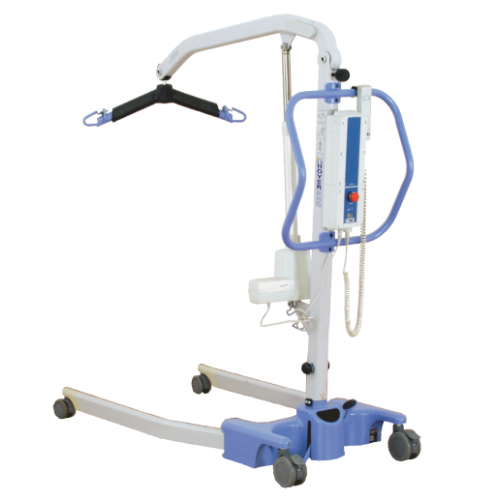 The Hoyer Advance Power Patient Lift comes with one battery and the charger is built-in. Plug it in anytime to recharge. The Advance Hoyer Lift is compact with a narrow base width of 22" so it will fit through most doorways. 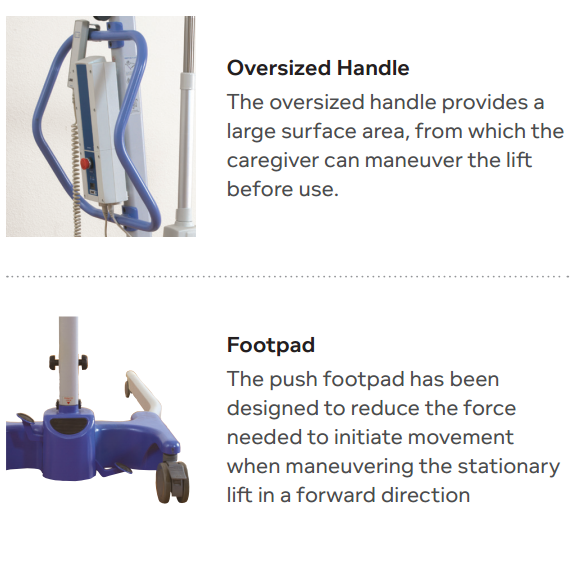 Despite the advanced compact design, the Hoyer Advance Professional Power Patient Lift is able to perform an outstandingly wide range of transfers, such as toileting, standing, and point-to-point transfers. The Hoyer Advance is nimble and highly maneuverable. This is a great advantage in environments where space and storage are at a premium. The Advance Hoyer Portable Lift is also a Folding Lift. 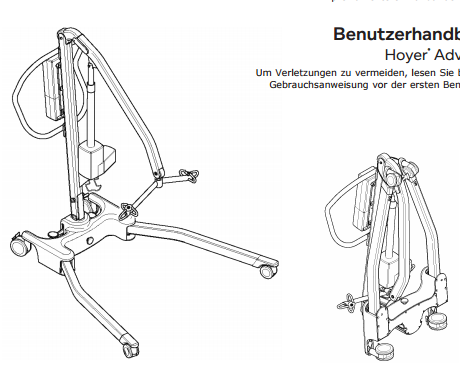 This patient lift can be folded, or separated for transportation. 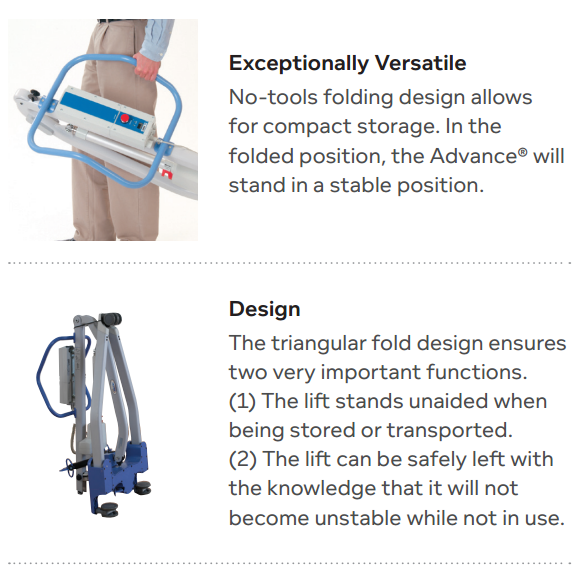 The Hoyer Advance Lift doesn't require any tools or special attachments to achieve its compact/folded position or to set it up in the new location. * Reach = center of spreader bar to the front of the mast. Lift – Internal power source. Intended operating environment: >+5˚C <+40˚C - Outside this environment functionality and safety may be compromised. Battery – 24vDC rechargeable sealed lead acid type. Battery capacity – 3.2A Ampere hours. Charger rated input – 100-240V AC 24 VDC 50/60Hz. Charger rated output – 29.5 VDC, Max. 19 W.
Hoyer Advance Lift Warranty: 2 Years on Parts - Limited. limited 1 yrs. limited 2 yrs. limited 2 yrs. limited 2 yrs. limited 2 yrs. limited 2 yrs. Does it include a sling? Can the patient lift operate while the batteries are charging? Can the patient lift manually operate when, for some reason, the batteries are completely discharged? What is the cost of an extra battery? Is there a separate battery charger for the patient lift? Thank you for your attention. The lift does not come with a sling. It's not possible to use the machine while charging the battery attached to the machine. A discharged battery will stop the lift from operating. Extra batteries can be purchased via special order. Chargers are available for purchase through this page. Hello Lance: The powered lift comes with a battery and the charger is built into the unit. Charging the battery is a simple plug-and-wait. Charge time is between 4-6 hours. Excellent tool. Worked during our power outtage since it is battery operated. I purchased this lift for my 23yr old disabled son. We plan to use it when we go out of town. When it arrived we were suprised to see it all folded up. It was easy to get it up to operate. My son is happy because now we have a lift that can go with him. The price we paid was great.